finaly I took a bit of time and looked at the games. A little jump and run game, where you must collect "screws" to repair your robot. To finish a level - collect the battery. Falling does not hurt. Some collision detection seems to be "strange". Game seems a bit unfinished. In principal a fun little game - the screen refresh makes it nearly unplayable. The game consists of only two levels - which I consider unfinished. - refresh rate is ok.
not 100% correct due to drift. does not run on a vectrex. Truncating the file to a shorter than 32769KB size does work. A simple shoot em up. Player can move left and right and shoot enemies. There are 3 different enemie types. the player knows where he stands. b) you have five lives, but these are not displayed. - ships are good recognizable and "big"
You move your ship around the screen and try to collect more fuel than the enemy in a given time frame. Another shoot em up. 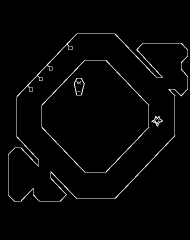 Enemies must be shot by a player moving at the bottom. The enemies approach in Galaga like fashion. Without overlay (and correctly placing it) the bullet meter can not easily be discerned (its just a dash at the top of the screen). Why the author chose that a player must SELECT a level every single game instead of just going on to the next - is beyond me. The game features nice large sprites and also rudimentary sound (shot/explosion). - cool "animated" score at level over! want to move and press button 1 - on the release of the button, the ship moves! - very annoying after game over you must reset the vectrex to start another game! of forward thinking and calculation - not to bad. (and thus losing a ball [player has 3 to start with]). (below 15 Hz). This makes the game sometimes hard to the eyes - but also a bit easier (since slower). There is rudimentary sound support. - collision detection sometimes "off"
This is presented as a racing game - although I would say its a "dodge" game. You drive on a road and must not get hit by other cars. both sides of the road which "scroll" (zoom) by. The overlay is great and fits the scenario. quite hard (the difference is only the count of lives). - refresh rate is actually very good (except explosion) about 50Hz! Thank you for these useful and intersting reviews, Malban! Good idea to have an additional "For a first vectrex game" rating. Thanks a lot for the nice reviews, Malban! I hope more will follow for the remaining games. Just to put things into the right perspective: Most of the final results are still prototypes, and most of them have neither been really tested on the original hardware, nor optimized. This was mostly due to the limited amount of hours the students could afford to spend on this course. Moreover, for most of them this was the first true programming and software project beyond prior academic examples. I have taken this into account when it came to grading the results of the course. So a student's individual progress and learning curve might not be truely reflected in the outside appearance of her or his final game. Most questions I could answer straight away - but you got me at the last question. That one is so arbitrary! I tried the obvious (the one done on the PDP1 (which I have written an emulator for btw) - but that wasn't right. Than I went further back to some sport for two - also tried boardgames, and read about what Alan Turing did in his spare time. But to no avail. I even wondered if lady Lovelace had something to do with it. I wonder what you consider the first, either it is outside wikipedia and any sensible search, or you need some correct spelling - or German - or I am simply to dumb. Wait - I got it. I am disappointed - THAT you think is the first??? Is not wave 13, although that would have been cool too! Actually - I like this game! It offers some diversity and computer opponents. The game can be played in three modes. Game 1: (more like training) you are alone and must eat the food that appears. You grow and after a time limit there is an end :-). opponent - you can eat him vice versa. "enemy" Bacteria. So there is realy some action and avoiding going on. The only thing missing for me is a little "intro" and some game over screen which shows your high score. But overall - a great effort and an original concept. - a "game over" would have been great! The main character is rudimentary animated, which is nice and quite sufficient for the game. The game has two different modes which vary slightly in speed and approaching objects. The game actually might be fun - but there are bugs, which may - or may not hinder gameplay. This is another breakout clone. c) it has a "game finished" screen, which tells you that you did well. The only drawback is, that the game only features 4 levels - but you can not have it all - can you? avoid them - which might prove tricky if you also have to hit the ball. - honorable mention - nice overlays! the "objectlist" of drawn vectors is not terminated correctly. draw loop continues with addresses in "not compiled" ROM areas. more forgiving than the real thing. On a real machine the game is not playable. Since I do my tests on a real machine - I did not test the game further. These were my "look ats" for today. Just a word on "perspective" :-). I know it is somewhat "unfair" to compare the results of the course with (most) other games for the vectrex. Please don't get me wrong - I think it is great that a course like that is offered at university and I would have loved to have one like that in my own university time. The results - for programming beginners - are absolut great, also considering these are "studies" and not hobbies and also keeping in mind the limited available time. 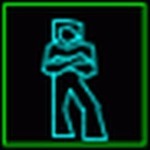 Nonetheless - as a vectrex hobbyist - I am also interested in the "quality" of the games compared to other available games. As a "curiosum" they are great, as an university project also. But lets face it - the quality (in comparisson) leaves room for improvement. And think I should be able to mention that in all honesty and fondness that I possess for the project and the programmers. Actually I did expect to see one or two new faces around the place (not that you Peer are not welcome...) and had hoped to interest them in continuing privately to get rid of some of the rough edges. Or did I just go blind and some of your students are hiding around here somewhere :-)? I'll try to finish my "reviews" over the weekend. I liked Artillery Strike. It just needed the game settings to be consecutive levels. and it's not even a computer game! the original brown box or /|\ version was discrete logic. ps I didn't know the 2nd to last one didn't feel like writing a c program to calculate it for me hehe. Same here. Got through them except the last one. Will have to figure out that one. I am very arbitrary about this game. The game idea, the presentation and the details of implementation are great. For me (the games I have looked at until now) this is the best of the lot. be a great game indeed. f) good scoring concept, scores visible! g) you can "kick" the bombs away! h) game over screen - with a nice vectorlist of the winner! If you stand on your own bomb (exactly) it does not harm you - is that intentionally? The instruction says for the joystick: "Move you ship around"
This actualle seems to be a bug, that ROM area is written to by the game - on a real cartridge this does not matter. This is a sports game - you have to jump hurdles! The presentation of the game is very good! and a hint of a reward ceremony. The game continues to go to a selection title screen (with animated hurdles on top). It feels "Track and Field"ish - great! first 110m than 400m and than 1000m (where I was disqualified). After the competition you are rewarded with a nice little ceremony display. You can controll the guy using the buttons. Button 3 is jump - the longer you press the higher he jumps. to press the button pretty exactly). 1000m run the "meters" do display the number of hurdles taken, not the meters! it is actually the games. (like the vectors) drift to zero. After 2-3 minutes you only see a black screen! a while the actual intensity displayed degrades to zero. This is happening with this game (and a couple of others - which tests I do not repeat now). Doing the competition mode - at the end of the 1000m run - I could barely discern the screen anymore! This is (as the name suggests) an artillery clone - nowadays you might call it an "angry bird derivat" :-). The game is pretty straight forward - angle your gun correctly to hit the enemy. There is nothing much special going on, there is no two player variant. Ten different levels of increasing difficulty (which must be chosen manually). The in game music is taken from "Armor Attack" which is fitting. The angle of the gun seems to be correctly calculated on the fly! You have lifeforce which gets reduced when hit in some way. There are "extras" you can catch as e.g. a shield (no damage) or extra health - or the BFG. The instruction gives some side punches to other games (Quake - Farmville). Also one of the aliens is called "Jäger" (German: hunter). - there seems to be a bug in the game - since it tries to WRITE to a ROM location. which allows ROM access per default) the game crashes after some bad ROM writes. The game is an adapation of the "snake" theme. avoid the screen edges. If you happen to start at the wrong time - you crash right into the wall - and game over! Due to the lower screen refresh rate with a longer snake - it seems that the game gets easier the longer you play. Pressing in game the "not occupied" button two plays a BIOS music tune. The manual explains a second control panel - but the game is single player. As in other snake games you are not allowed to touch the walls - you die as soon as this happens. I find the "menu system" annoying. The game starts right away when the cartridge is loaded - ok (no menu - I can live with that). But after you die (which will inevitably be just as you start the game) - RIGHT away the next game starts. to steer it - otherwise you jump from one game over to the next. As if that is not bad enough - ingame, after you reach a certain length you enter the next "level"
(snake shortened - speed goes up) - here the same! (since screen updates now are really fast (no text + short snake) - you almost certainly crash against a wall. (for me - 3 out of 4 times) which makes it nearly unplayable. between only small snake (50Hz) and the +text version (25Hz) is half! - See above the Intensity interlude! I tested all games using the VecFever. Per default (is switchable but did not do so) VecFever allows writing to ROM areas. Some of the games do that - and crash therefor (or behave weirdly) on my real vectrex. I tried to figure out when that happened. Writing to ROM for me is a bug! But the game might nonetheless be working ok on the real machine sporting a cartridge of the game. Wow, thank you very much for all these reviews, Malban! This is very valuable feedback for both the developers of the games and the people who want to try out these games. ^Another thanks from myself, as I need to add all of those to the games page on the wiki. Been meaning to do that for a while. After completion of the course, some of the students originally had announced to go on with their projects, but almost all of them started working on their final thesis last October (elective courses are in semester 6, thesis is in semester 7) and are facing their final exams right now. I guess that is the reason why there was no further Vectrex related activity from their side. We never got around to serious testing and bugfixing due to lack of time, but I have collected and saved the complete sources. Maybe at some point in the future I will find the time to fix some of the issues Malban discovered and reported, and generate some updated versions if the authors agree.